Whether you are traveling for business or pleasure, settled in your community or looking to relocate, you can nd a fellow Oredigger in almost every major city around the world. With each new graduating class, M Clubs grow as our newest alumni embark on their next journey. Alumni volunteers lead the charge and organize a variety of events and programs throughout the year to keep alumni connected and informed. M Club leaders are the cornerstones of our global, robust alumni network, which currently includes 55 clubs (and counting!) and serve as university ambassadors. Favorite gatherings include E-Days ’Round the World, networking events, professional development programs, golf tournaments and welcome parties for incoming students. 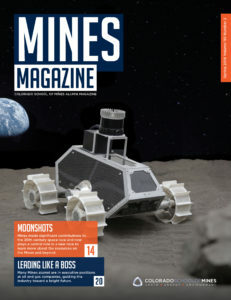 We invite you to stay connected and celebrate the Mines spirit! Interested in taking an active role with alumni in your community? We have clubs all over the country and around the world. Visit minesalumni.com/MClubs to connect with an M Club near you!